Applications - HVAC industry for duct and equipment applications. 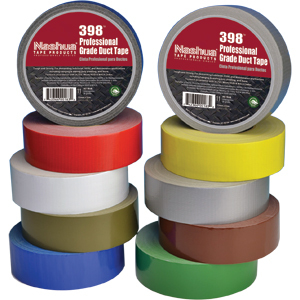 High quality maintenance tape in a variety of manufacturing environments. Broad range of applications in the construction industry. Asbestos removal and polyethylene hanging. Features & Benefits - High quality polyethylene coated cloth tape. Conforms well to irregular surfaces. Adheres to a wide variety of surfaces. Tears straight, hangs straight, curl resistant. Easy unwind.